Archi-Loom A is a large 3-dimensional installation utilising re-purposed materials including bamboo, recycled rope, various fabrics and other found materials. It is an interactive construction which is constructed by the Slow Art Collective in conjunction with various participants including children and aged people and various interested members of the community. After Slow Art Collective have constructed the giant loom the various participating collaborators fill in the walls of the structure by weaving the various found materials into the loom. Archi-Loom is a colourful and playful work that is able to respond accordingly to the various sites and needs of the various contexts that it inhabits. The installation will offer a space that invites areas of play, rest, craft and discovery. The project focuses on the value of collaboration and explores concepts of value and sustainable practices. By using very simple technique, the installation invites anyone regardless their skill level or experience to contribute. 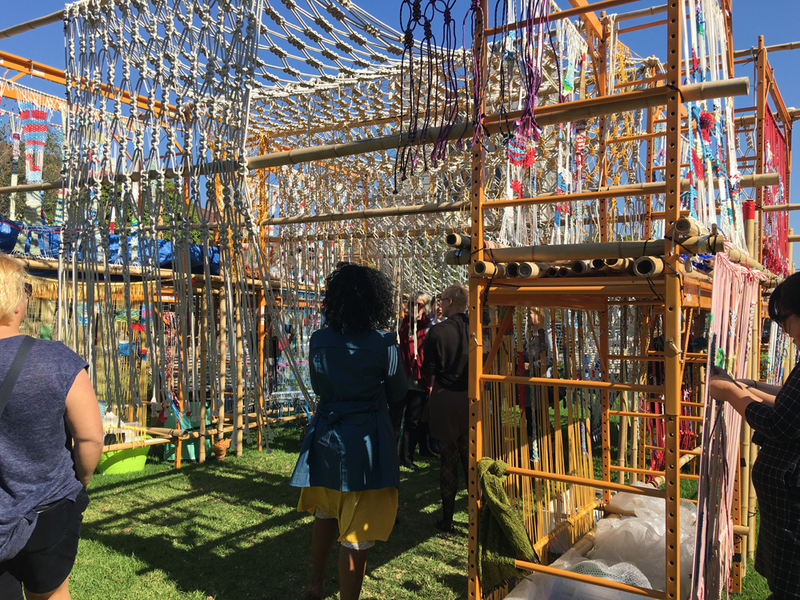 Regardless of the age group and gender difference, participants enjoyed the idea of weaving the loom inside and outside and having authorship of a large slowly evolving collaborative installation. Slow Art Collective (for this project: Dylan Martorell and Chaco Kato) is an artistic collective that focuses on creative practices and ethics relating to environmental sustainability, material ethics, DIY culture and collaboration. As an interdisciplinary group of artists, Slow Art Collective is interested in process-driven practices where the focus is on the act of making. In the past 9 years, Slow Art Collective created various large scale participatory works that often play with ideas of sustainability, improvisation, on site learning and experimentation often incorporating various elements of DIY sound experimentation, weaving, food and plant production and gameplay.